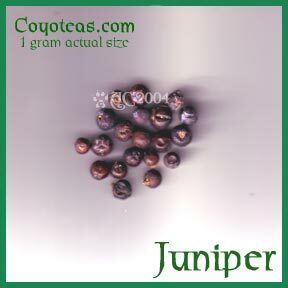 More Information: Juniper berries have a fragrant, evergreen-herbal scent. They can be smoldered as incense, mashed with hot water to become a poultice, or soaked in water for a medicinal tea or bath. A warm poultice of the berries applied to the skin is said to ease bruises, arthritis, and similar aches or minor wounds. Traditionally, a tea can be drunk for urinary tract infections or to fight off illness. (Caution: do not use if pregnant!) (This statement not evaluated by the FDA.) Herbs.